"I move into the penalty area and it's me alone with the goalkeeper. For every metre I get close to the goal and goalkeeper, the goal gets smaller and smaller and the goalkeeper gets bigger and bigger. And I shoot wide, or over the bar." This was the damaging scenario built up in the head of a leading European striker going through a major goal drought in the late 1980s. The forlorn forward had gone to see Dr Willi Railo, the Norwegian psychologist who worked for many years with Sven-Goran Eriksson. Railo, who has mentally coached strikers all over Europe including a spell with the England team during Eriksson's tenure, described this as a 'typical example of how the brain can become badly programmed, preventing the player from making the most of his ability'. Football always seems to have at least one high profile player at any given time who looks like he can't hit the backside of a cow with a banjo. On Wednesday, Fernando Torres was set to start his sixth game since joining Chelsea for a record fee of £50 million. The Spaniard is yet to get off the mark for his new club. Despite getting into good goal-scoring positions, Torres has often snatched at chances, scuffed his shots or delayed shooting, allowing his opponents to smother the ball at the crucial moment. However, the misfiring ex-Liverpool striker could be rested and dropped to the bench, his manager Carlo Ancelotti revealed this week, meaning the wait could go on. Has he developed the kind of mental block that Railo's subject had formed or can all his troubles in front of goal be put down to settling into a new club and the fall-out from a long period of injury woes? Rhonda Cohen, a leading sports psychologist and head of the London Sport Institute at Middlesex University, believes Torres needs to start thinking positively - and in the present. "Torres does seem to have had a problem settling in to Chelsea and his remarks recently suggesting that he would welcome a Jose Mourinho return to Chelsea make it sound like he is projecting his anger onto the manager. Being new and unsettled as well as angry can cause distraction," Cohen says. "In addition he has the competitive pressure due to being bought for such a high salary. Torres needs to manage his stress. He has to focus on each move, each shot and stop feeling or over-thinking the pressure." She adds: "Torres speaks about the identity he felt at Liverpool. This raises the point of whether he is playing in the present or stuck in the past. He needs to be in the here and now. Some team building with Chelsea to make him feel at home, relax and play in the moment will help him start to deliver the goal scoring results that he is capable of." Torres is not the only big name striker in Europe currently struggling to hit the proverbial barn door. In Italy, AC Milan's Zlatan Ibrahimovic had gone five weeks without finding the back of the net before being handed a three-match ban for his petulant sending off against Bari at the weekend. He had cut a frustrated figure in the match and reports have suggested that he is not dealing well with the weight of criticism levelled at him for AC Milan's failure to score in 180 minutes against Tottenham. Whilst Dutch forward Klaas Jan Huntelaar has not scored for his club Schalke since November - but incredibly has banged in 10 goals in his last six international matches for the Netherlands. Performance psychologist Chris Walton says Huntelaar's contrasting form could be down to him feeling more motivated to play for his national team. Walton says: "Perhaps Huntelaar enjoys the international buzz more, or the players that he's with. It must be a motivation thing. The vice-versa is Wayne Rooney at the last World Cup. Although you could never say that he is not motivated, you could tell he was not as happy and content as when he plays with Manchester United with the daddy/God-like figure of Sir Alex Ferguson supporting him." He adds: "Whenever a player is not performing like they know they can and if they are physically fit and healthy then it can only be a couple of things. Firstly, the team dynamics don't fit for them which can include many things; players, club rules, management, coaching styles. Secondly, their inner game is off. They have lost belief in themselves, they dont feel motivated and doubt themselves." "Diego Maradona mostly loafed around on the field but after the match he came up to me and said 'Congratulations on the win mister, but on Sunday you will be dancing to a different tune.' We met Napoli again four days later - this time in the league. We weren't given a chance. 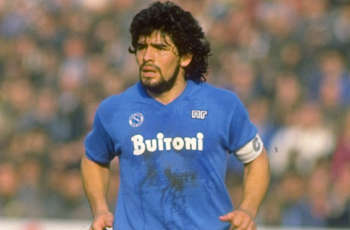 Napoli won 4-0 and Maradona was brilliant throughout the match. That just shows what motivation can do. Maradona was simply incredibly motivated in the league match but not in the cup match." The list of well-known strikers to have suffered goal droughts in recent years is almost endless. In the UK we have all seen the likes of Jermain Defoe, Peter Crouch and Robbie Keane go on agonisingly bad runs whilst on the continent Diego Forlan, Lukas Podolski, Daniel Guiza and Amauri - who infamously could not score for one year at Juventus - have all endured spells when the ball simply didn't want to obey them. But this is far from a new phenomenon caused by the over-burdening of expectation on the game's modern day football star. Even one of the most prolific goal-scorers of all time, Gerd Mueller, who netted an astonishing 14 times in two World Cups, suffered from lean spells at his club Bayern Munich, during their most successful period in the mid 1970s. His former coach Udo Lattek recalls: "Mueller had periods where he didnt score for seven games - or more. I've asked him always: 'What's up?' His reply? 'I'm thinking about how to net the ball in.' I always said to him: 'Don't think about it - just do it - just score.'" Lattek's successor dealt differently with a Mueller mini-drought in the the 1975-76 season. Instead of telling him to stop thinking he tried to get him thinking positively once more. "Cramer showed Mueller his most beautiful goals on video, to give him more self confidence in the penalty area," says Goal.com Germany's Francois Ducheteau. "He named this 'visualisation' - and it helped, Mueller scored and scored and scored again after this and Bayern won the Europa Cup and World Cup for clubs." Whether Torres can open his Chelsea account against Copenhagen on Wednesday night remains to be seen. Indeed, he may not even be given the chance and an evening spent stewing on the bench may not help him get his Chelsea career up and running. According to Walton, he is showing the classic signs of a footballer suffering a crisis of confidence. "His belief and identity in himself as being a top goal scorer may have been rocked by the move, new team mates, new location, new training programmes and this maybe stopping him get in the zone on the pitch," he adds. What would not being in the zone on the pitch look like? "Don't think about it - just do it - just score"
"Well being one metre behind getting in the right position, not connecting mentally and intuitively with his team-mates during play, having a doubting inner voice when shooting at goal and so on.. I think this is what we've seen from Torres so far." But the beauty of football - and a ray of light for the Chelsea fans that rushed out to put that replica Torres shirt on on February 1 - is that one goal can change it all: "If Torres blasts a couple of crackers in against Copenhagen then all of a sudden his belief will be reinstalled and he will be able to enter the zone again. "Being in the zone would be feeling like you have all the time in the world on the ball, the goal seems massive and the goalkeeper seems small - a sense of timelessness." It was that sense that he was operating one step ahead of every player ahead of him, which helped make Fernando Torres a sharp-shooting idol at Liverpool and the world's most expensive striker. If Chelsea - and Roman Abramovich - are to see that Torres again, then evidence certainly suggests that there is a battle to be won in the mind as much as on the pitch.